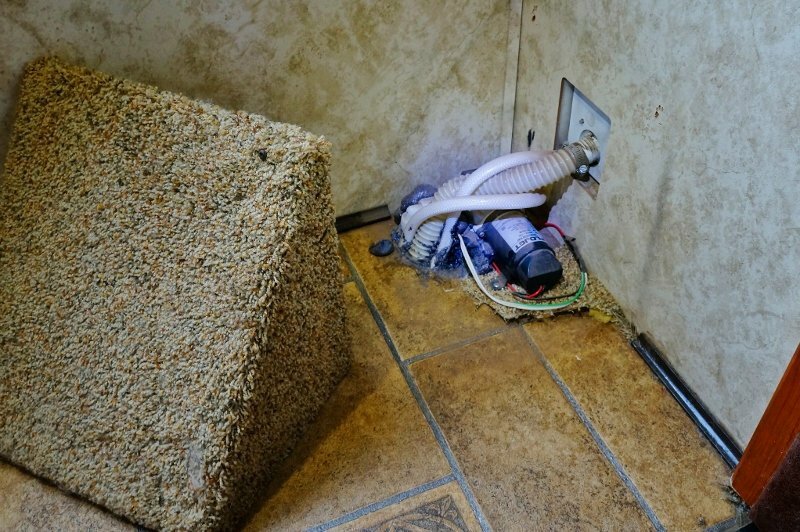 Our Keystone Cougar fifth wheel trailer didn’t come with any sort of easy winterizing tools with the exception of the water heater bypass valve. It didn’t concern me much as we are snowbird RV full-timers and usually blast off south before any very low temperatures occur. Unfortunately, that wasn’t the case two years ago when my wife had a health scare that required us delaying our travels until well into December while she had medical tests performed. 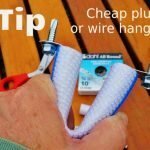 It turned out all good but caused me to have to do a crash course in winterizing techniques. 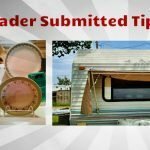 At the time, I elected for the very quick method detailed in this blog post. 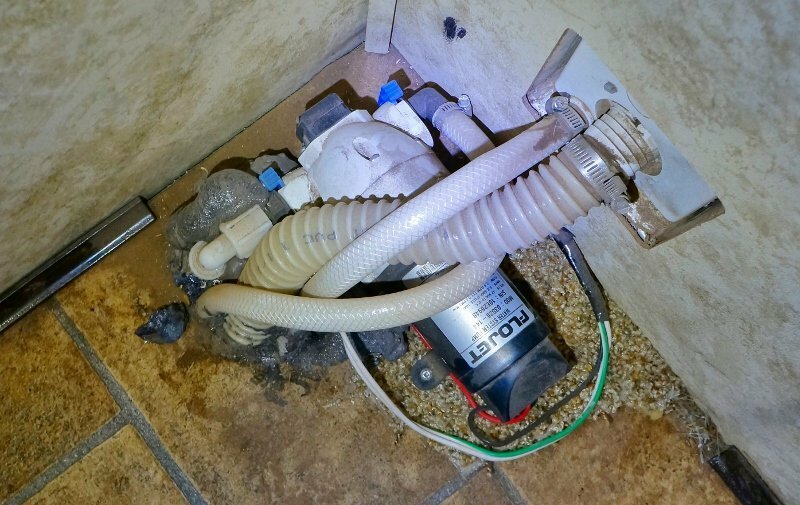 Basically, it involved dumping many gallons of RV antifreeze into the fresh water tank and pumping it through the RVs plumbing. 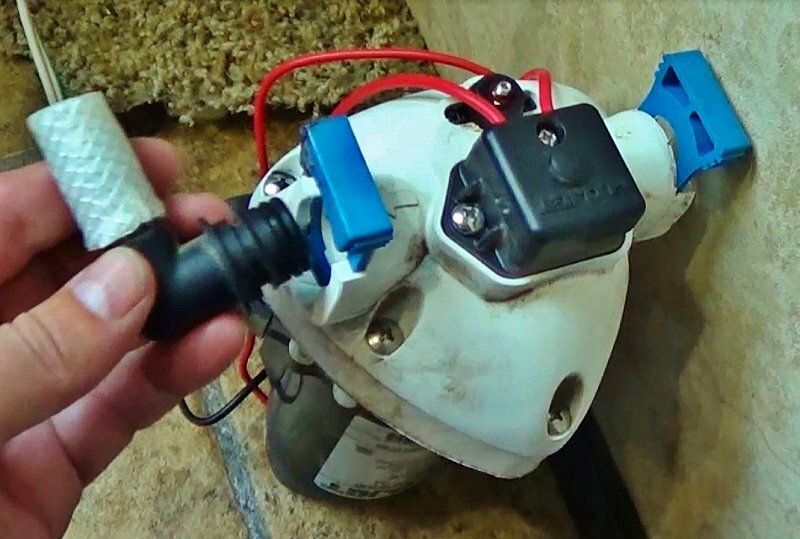 The quick method worked fine and protected our plumbing from some very cold weather, but it did take a long while for the antifreeze to work its way out of our fresh water tank. 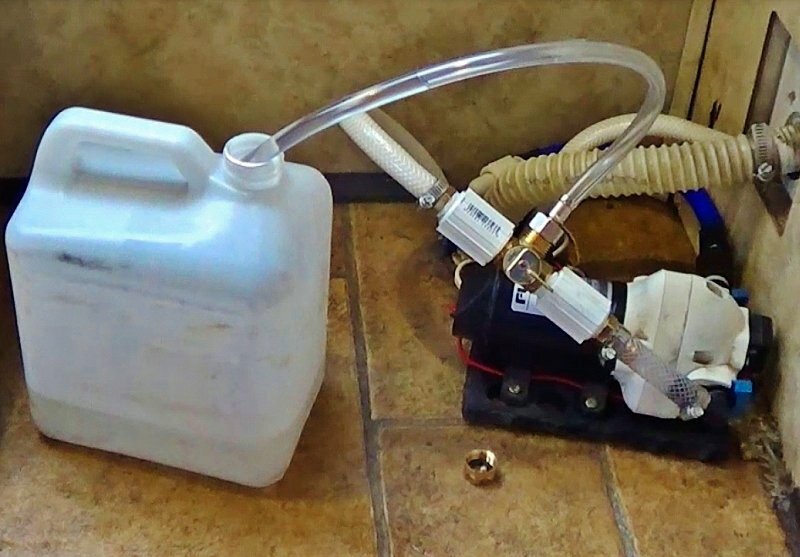 Ever since then it’s been on my RV to-do list to install a proper winterizing kit onto my water pump. With the winterizing kit installed in line before the pump the amount of RV antifreeze required is only one, maybe two gallons. The kit is also very handy for drawing vinegar into the water tank during its maintenance. 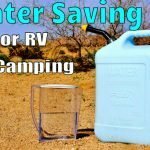 What RV Winterizing Kit Did I Buy? 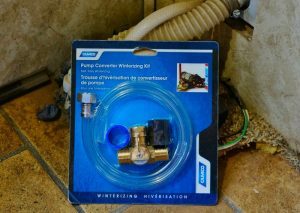 I picked myself up the Camco Pump Converter RV Winterizing Kit which comes with a very nice brass T-valve, suction tubing and pump adapter hardware. I was psyched to start on this RV mod project one rainy September day. I accessed the pump location by removing 4 screws on the carpeted enclosure and had a look but was left scratching my head. There was no way this kit was going to fit on my FloJet Model 03526 water pump! 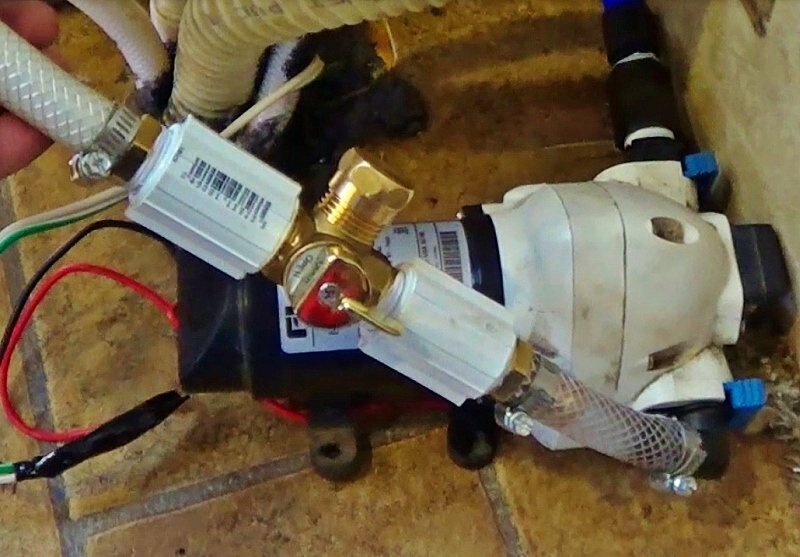 My Flojet pump utilizes plastic quick connections on the input and output ports. The Camco kit used threaded connections. This threw a monkey wrench in my grand plan. Adding to the grief was the placement of the pump itself. Crammed into the rigs corner and all spray foamed in place. 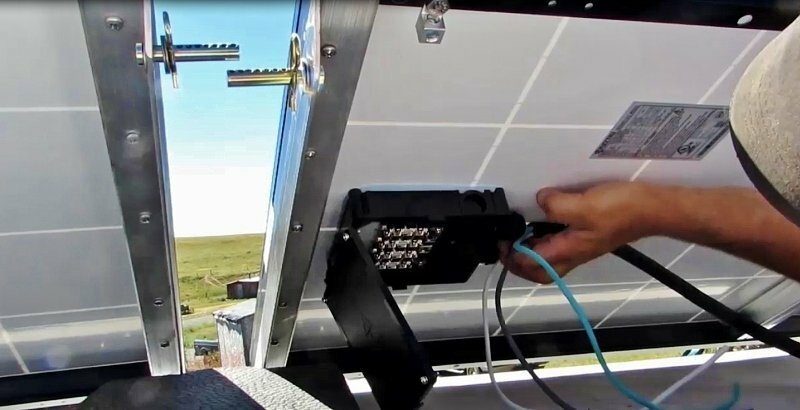 The position of it didn’t lend itself to adding in the winterizing kit hardware and hoses. The spacing was way too tight. I decided I may as well mod the whole setup, so off to the local hardware store I headed to pick up some connectors, plastic hose, clamps, etc. While I was at it I said let’s go “whole hog” and build myself a new water pump enclosure, so picked up some wood plus hardware for an access lid. 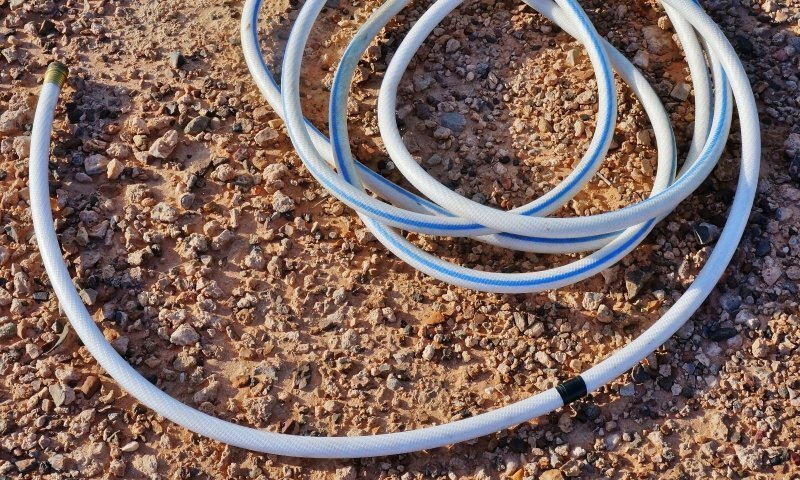 Keystone had hooked the pumps input pipe straight to a (fixed to the floor) piece of Pex plumbing pipe. This is not what the Flojet manual states. 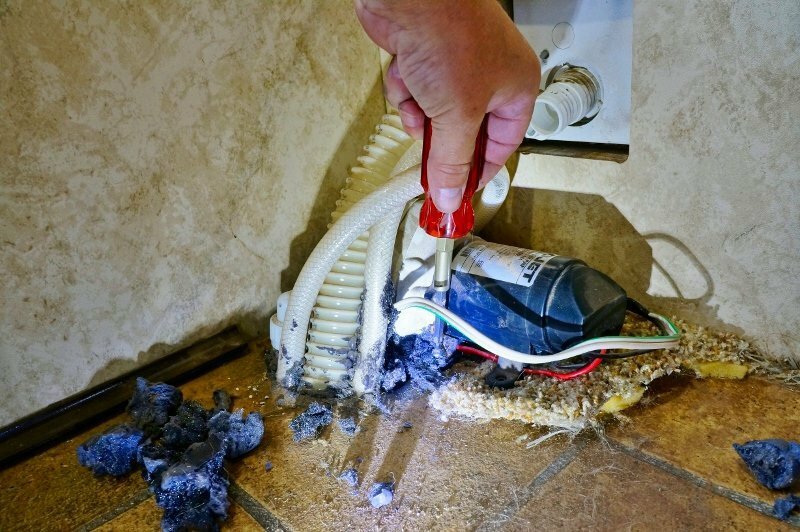 To help reduce noise and vibration the manual says to use a flexible hose on both the input and output. 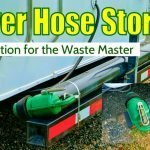 I decided to move the pump to a new location where I could add in some more hose, plus have the room to add my Camco RV winterizing kit. To install the kit I had to use a few extra bits and pieces of hardware, but it was all very cheap and easily found with help from a dude at the local Home Depot. 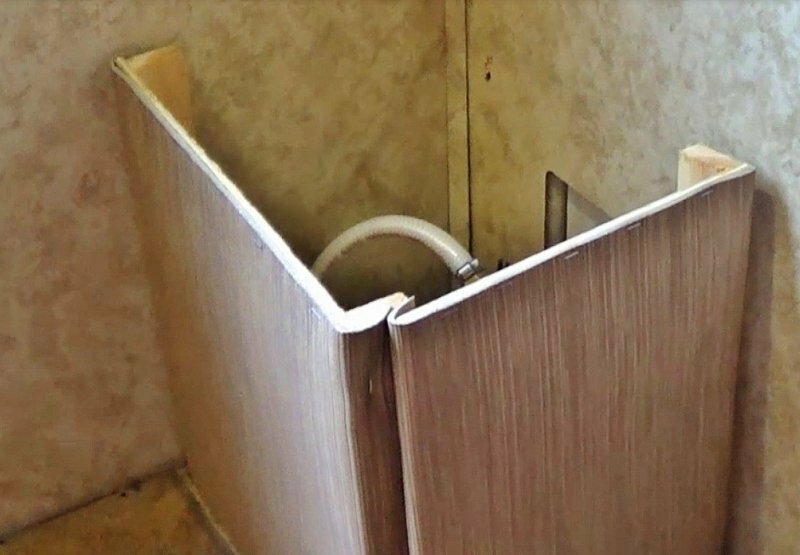 Soon I had it all screwed together using Teflon pumping tape in the threads for an extra measure of leak prevention. I also added a piece of rubber matting under the pump to try and reduce the noise and vibration even more. I fired up the pump and gave the new winterizing kit a try on a gallon jug of water. Success! It pumped it through with no problem and no leaks in my modded system. I’m still not really happy with the loudness of the pump, but I think that’s as quiet as it’s going to be. It’s not the best pump out there. I plan in the months to come to swap it out for a Shurflo Model 4008. 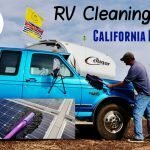 An RVer friend of mine has one and highly recommends it. 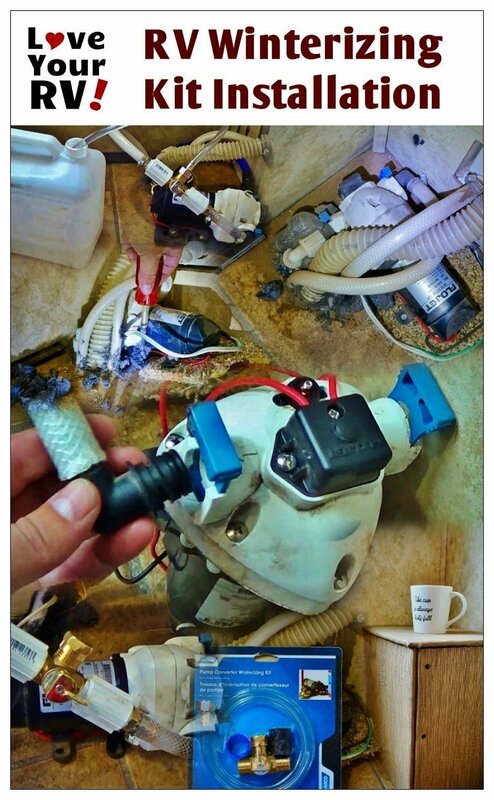 *Update* – I just installed a new Shurflo Model 4008 pump in place of the original FloJet and it is much quieter. The original water pump enclosure was a carpeted triangle shaped thing that screwed to the floor and wall. 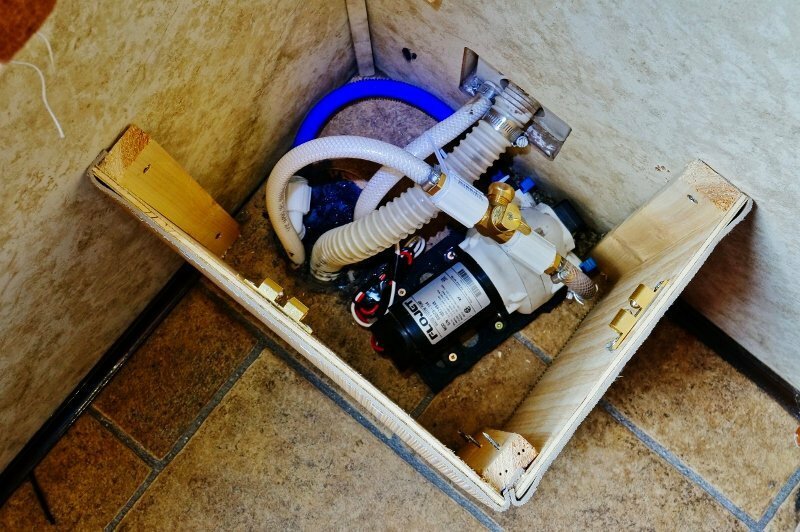 In order to rearrange the pump location and add in the extra piping I needed a little more space, so decided to build myself a new water pump cabinet. 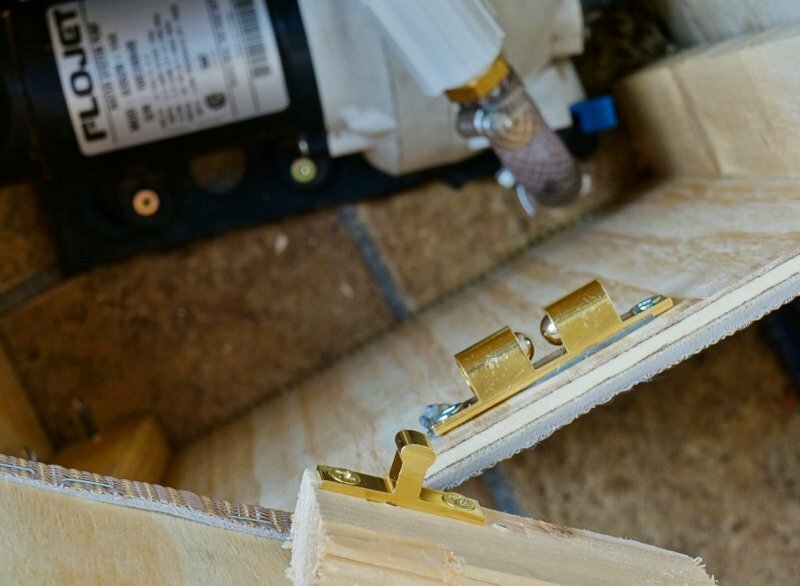 It’s a simple design using some ¼ inch plywood and a few 1x2s for bracing. I added a lid and used a pair of brass ball bearing clasps to hold it in place. For the covering material, I used some extra pieces of Infinity Luxury Woven Vinyl versus carpet. 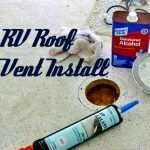 If you’ve followed my recent RV Summer Renovation series of posts you’ll know I’ve used it now in place of the rigs RV carpeting. 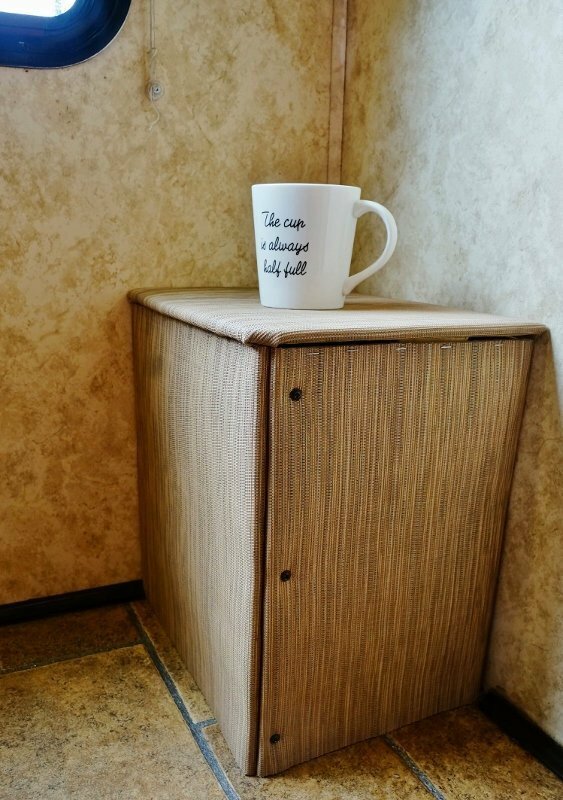 The new water pump enclosure now matches the rest of the living room décor and can be used as a convenient little coffee table.